On Valentine's Day Barney, Lucy, Alison and myself attended the Parlours of Wonder event at the University of Bristol's Graduate School of Education. On the 18th of January I joined Barney, Lucy and Hannah on their visit to Deerhurst care home in Soundwell. This was my third day working for Stand + Stare on my University of Bristol placement, and my first visit to the home. After discussing and trying out various possibilities for the illustrations, we decided that sea shells (particularly conch shells) were the perfect visual metaphor for the Tangible Memories project and an ideal vehicle to trigger audio clips within the book, app or any other surface that they may appear on. 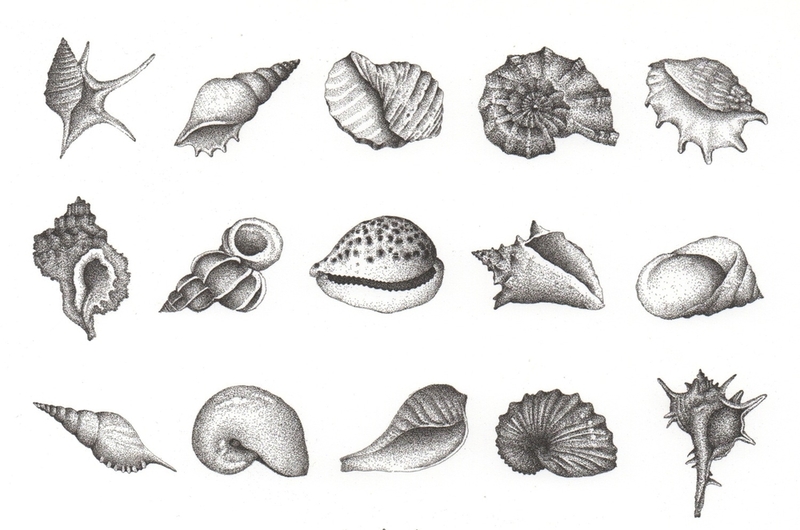 You hold a shell to your ear and listen to the memory of the sea, just as memories are held within books. The rich visual qualities and the variation of different types of shell are similar to a person's life and the memories that are collected over time, this idea became more prominent the more I studied the shells and realised just how intricate and complex they were! Visiting the care homes and meeting the residents and carers was an integral part of this project for me. I was able to experience the fundamental notion of the Tangible Memories project first-hand; communication and the sharing and recording of memories. The process of recording people's memories and stories, whether it be through writing, taking a photo or audio recording engages both the resident and the listener. Listening to people’s stories and memories was hugely inspirational and being able to preserve these memories in a tangible way is fantastic! I am delighted that I was able to contribute to this project. We are in the process of creating our second interactive book for the Tangible Memories Project, this time with one of the residents at Blaise Weston Court. It will be a collection of memories, photos and stories from her life.